Set of performance parts. Composed by Georg Philipp Telemann (1681-1767). Arranged by William Primrose. String Solo. Baroque. Set of performance parts (includes separate pull out viola part). With solo part and piano reduction. 20 pages. G. Schirmer #LB1973. Published by G. Schirmer (HL.50481381).
. Fast movements are fine. Never thought I'd say this, but I actually prefer the international edition to this one. 9 of 18 people found this review helpful. 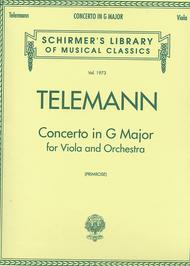 writing, they do depart from the early intermediate pedagogical purpose of many people who approach the Telemann concerto. I don't whose fault is it, however: the publisher's or the website's, but the edition *should* say "edited, with embellishments by William Primrose". excessive interpretation. the second and fourth (the faster movements) he didn't mess with as much. third movement also disappointing. never thought I'd say this, but I would prefer the International edition over this one. December 08, 2008 Not the Primrose! 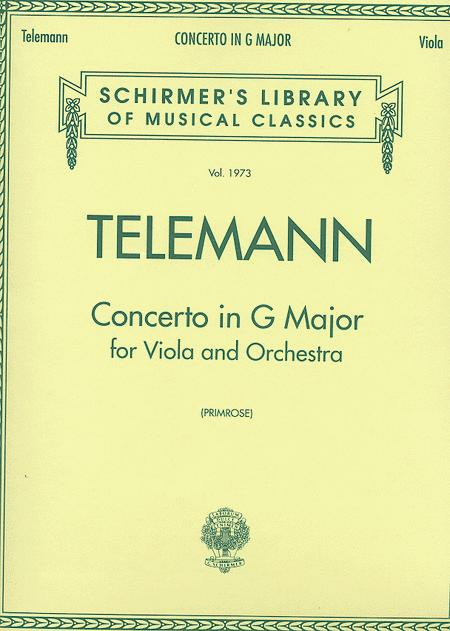 or to plan anything remotely similar to the actual Telemann concerto. I am an advanced viola student, and have played several different editions of this concerto. I recommend Suzuki's (Viola Book 4), or any Urtext. September 06, 2007 Simply Amazing!!! One of the best piece I have played so far and this is only my fifth year playing a viola, I really love to play this over and over again. 19 of 49 people found this review helpful.